Washington, D.C. June 18th, 2016: TCG has been named a Washington Post 2016 Top Workplace for a second year. In its third annual survey, The Washington Post’s Top Workplaces list spotlights private, public, nonprofit and government agencies with the highest ratings from their employees in a survey conducted by Workplace Dynamics. TCG also featured on the 2015 Top Workplaces list. A total of 150 companies were awarded at a celebration on Thursday, June 16 at The Washington Post. TCG is the #1 Custom Software Development and Consulting company, #1 government contracting small business, and #7 of all small businesses on the list. In addition, TCG is featured in a special section of The Washington Post on Sunday, June 19. 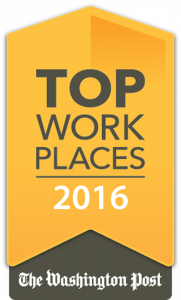 To read more about The Washington Post’s 2016 Top Workplaces, and learn about the benefits TCG offers, visit the Washington Post website and our careers page. The Washington Post is Washington D.C.’s oldest and most widely circulated newspaper. Regarded as one of the nation’s premiere newspapers, The Washington Post is known for its political reporting on the inner-workings of the White House, Congress, and other aspects of the U.S. government. TCG is Great Place to Work Certified » « Bravo for Brava Award Winner Lisa Alferieff!